The former lifeboat was built by the Thames Iron Works at Canning Town in London in 1909 at a cost of £722 9s 1d (£722.45) funded by a legacy from William Riley of Coventry. When built the hull was numbered No. TL37. 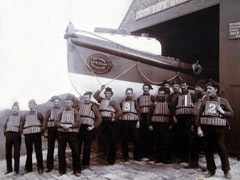 The Thames 34 ft self righting lifeboat had an 8 ft beam, with 6 tubes used for relieving any water washed inboard. The lifeboat had wooden / iron keel with two bilge keels as well as two water ballast tanks weighing in at 2 tons, it had no sails or motor and was a rowing lifeboat rowed by 10 oarsmen. The lifeboat was taken into service by the RNLI on the 11th June 1909 and her official number became “ON 594” she was placed on trials until the 18th June arriving at the Upgang station on the 27th July relieving the previous station boat "Upgang". William Riley was named on 23 August 1909 by the wife of the local MP The Hon. Mrs Gervasse. Although the William Riley replaced the Upgang, the latter must have been in poor condition as reports indicate that the reserve boat "James and Caroline" was on station for a year. 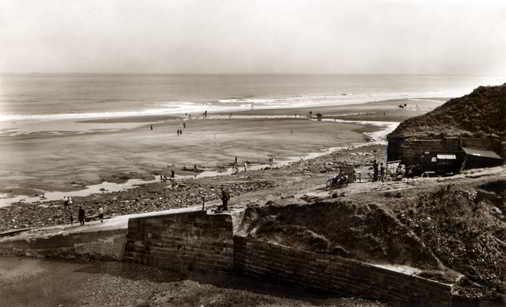 The station closed on the 13th November 1919 and the lifeboat transferred to the Whitby station, the photograph to the right represents Upgang ravine close to where the station was located before it was dismantled. 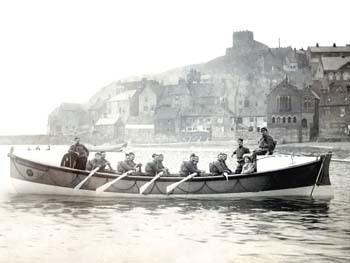 The lifeboat stayed on station at Whitby until the 27th May 1931 when she was effectively decommissioned. The lifeboat holds a history of being launched on service twice at Upgang and a further thirty one times at Whitby, saving no fewer than 10 lives. After being decommissioned the William Riley was returned to the store yard where her early trials had been conducted from and placed as the 1st reserve, she was held on her carriage throughout until finally sold in November 1931 for just £35. Following her sale she was converted at some cost into a private motor cruiser, where it is believed she spent the 1960’s and 1970’s at Redstone wharf in Stourport on the river Severn. The ownership of the lifeboat was transferred to a builder in Stourport in 1982. During the 80’s the boat was restored and part of this restoration involved the fitting of a 2.2 litre BMC diesel engine. It was in the late 80’s or early 90’s that the boat was moved to Devon and moored at Barnstaple. Ownership was once again transferred in 2001 and the boat underwent another conversion, this time with a cabin and stern mounted engine and some further restoration. Nothing was to become of this restoration presumably after she had somehow ‘sailed herself’ into a low bridge at Barnstaple almost taking the wheelhouse completely off. Later, on a low tide the boat sadly settled onto a mooring post resulting in a hole in the hull below the waterline and it was in this state that after many years of neglect that she was found.